You will be given a reference e-book to read which has 85 pages And the test will be based on that e-book , you can take final test within 1 year of purchase. Electrical safety is a term used to describe the implementation of safety and preventative measures when it comes to preventing dangerous electrical risks and hazards. Working with electrical circuits or power tools may expose you to the risk of facing electrical hazards including electric shock. Your exposure to these risks is the same whether you are working at a workplace or at home. Most electronic workers are exposed to these risks and hazards because their job sites tend to have cluttered materials and tools, are fast paced and more open to harsh weather conditions. The use of electric power tools and electrical circuits also increase your chances of dealing with these hazards. Be aware that a close contact with a high electric voltage may result to the flow of current all throughout your body. This may result to burns, shocks, serious injuries and worst, death. Because electrical workers are more prone to dangers, you have to improve your knowledge about electrical safety. Everything that you do should be carefully planned. It is also important for you to become more familiar about the terms and tools used in performing electronic tasks including resistance, amperage, voltage and circuit. This will allow you to work seriously while still practicing extreme caution. You should also improve your skills in dealing with the most common injuries associated to performing electrical projects including electrical shock, electrical burns, thermal contact burns and arc burns. 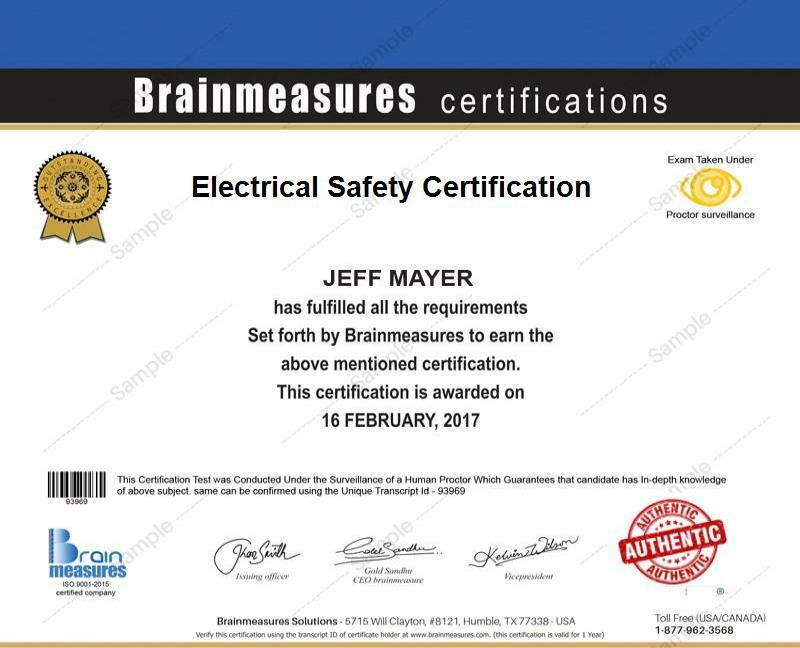 Enrolling in the electrical safety certification program offered by Brainmeasures is the best thing that you can do if you want to become more familiar about the basics of implementing electrical safety and precautionary measures. By enrolling in the electrical safety course offered by this impressive online certification company, you will be more enlightened about the risks and hazards associated to running electrical projects. This certification course permits you to learn through a highly comprehensive electrical safety training which covers all the information that you need to become an expert in electrical safety including the most crucial electronic terms and concepts, the most common electrical projects that you need to complete, the different tools that you need when performing electrical projects, the most common injuries faced by experts in this field when performing the tasks, safety measures that you should follow when performing electrical projects and the most effective techniques that you can use in case inevitable accidents take place at the workplace. Completing this certification course will allow you to receive an electrical safety certificate which shows how cautious you are when performing projects. How will you experience electrical shock? How to effectively control hazards and enjoy a safer work environment? Considering the many hazards associated to running electrical projects, you can expect the electrical safety certification course to work perfectly for a lot of people. You can expect this certification course to become even more beneficial for electrical workers, electrical engineers, HVAC technicians, supervisors, instrumentation mechanics and any other individuals and professionals who wish to gather relevant information about electrical safety because of their regular exposure to electrical hazards including electrical shock, burns and arc blasts. Your salary as an electrical safety certification holder is also among those that you will surely enjoy after successfully completing the course. Your electrical safety certification is extremely useful in applying for an electrical superintendent position which is a huge help in increasing your income to $62,000 to $89,000 per year. You also have greater chances of working as an electrical and instrumentation engineer which offers a more profitable annual pay of approximately $75,000 to $106,000.